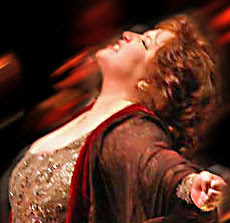 There are very few opera singers today that possess the old school "diva-ness". One that does, is soprano Aprile Millo. Although she isn't seen performing in New York as often as some would like, The New York Times has said "Millo is considered the last of the Golden Age sopranos..." and Newsday has called her "...the High-Priestess of that old time operatic religion..."
The first time (and last, actually) that I heard Ms. Millo was at the Richard Tucker Gala in 2003. It was at this gala that, although ill, she tried to sing an aria from Licinio Refice's opera Cecilia. After the attempt, she announced gracefully from the stage that she would not be able to go on. Her absence gave way to an impromptu debut for a certain Lisa Daltrius, who stepped in at the request of the Richard Tucker producers. I was so hoping to have heard Aprile Millo live. Well, the wait to hear Ms. Millo live might just be over. This fall, Ms. Millo will be making her New York recital debut - it's hard to believe that she's never given a recital in New York given the length and breadth of her career. 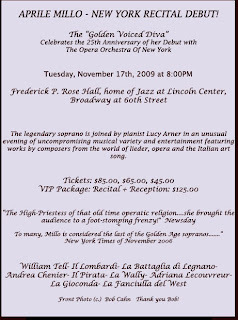 On November 17th at Frederick P Rose Hall, she is going to sing a one-night-only event to celebrate the 25th Anniversary of her debut with the Opera Orchestra of New York. I'm very much looking forward to it. And, you can bet that you'll hear about it here.